Riding on the buzz generated at the Craft Brewers Conference in San Francisco, High Water Brewing experiences hot demand for its initial product offerings. During the Craft Brewers Conference, High Water presented both styles of beer to craft beer industry professionals and fans from around the world. “At this point we have requests to fill orders from not only establishments in our own Northern California backyard, but also from Southern California and as far away as New York,” according to Anthony. To help keep up with demand, High Water Brewing has purchased and installed two new 30 BBL fermentors at Drakes Brewing Company in San Leandro. Cooperage (100 kegs) has also been purchased and put into service along with a “cold box” for the High Water distribution and storage warehouse, located adjacent to Drakes. In addition, a new delivery van is already making the rounds for High Water Distributing, a subsidiary of High Water Brewing. Steve Altimari, President and Brewmaster, recently announced, “Our second batches of Retribution and Hop Riot will be finished soon and what we’re really excited about is that much of this will go into bottles for our bottle release.” He added, “Brandy barrels are arriving as we speak for our barrel aged beer, which will be released later this fall /winter.” Altimari promises to keep everyone informed on the exact date for upcoming High Water Brewing bottle releases. The company has quickly met a number of its startup benchmarks, a strong indicator for future success. High Water will soon announce a new stock offering on their web site. 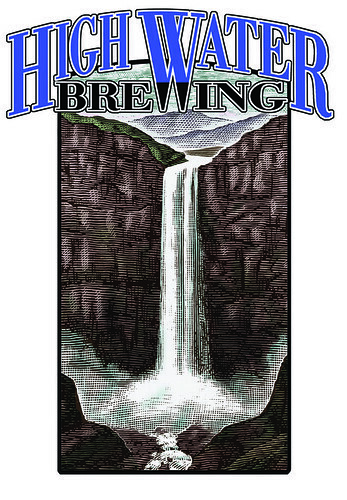 About the Company: Based in San Leandro, CA, High Water Brewing is a corporation with principals Steve Altimari, John Anthony, Lane Anthony, Kevin Sweeney and Davin Abrahamian serving as company officers and on the board of directors. In order to meet the future demand for product, capital is being raised for a new manufacturing venture; the company web site has details on the most recent stock offering. Have you ever been to Valley Brewing in Stockton? Me neither, though I used to hear the beers were worth the trip. Good news for us: Valley’s former award-winning brewer, Steve Altimari, has started his own brewery in San Leandro, making his highly-praised beers readily available in the East Bay and San Francisco. Altimari’s first two beers at his new venture are both IPAs. Hop Riot is a 7.3% west coast IPA finished with Apollo and Citra hops, and you’d be forgiven for thinking it’s a double IPA. Altimari’s actual double IPA, Retribütion Imperial IPA, is 9.5% alcohol, 95 IBUs and “a very hop-centric introduction [to the new brewery],” said Altimari, “but there is nothing wrong with that in today’s beer climate.” Hop Riot and Retribütion will be available in 22 ounce bottles as well as beer bars in mid- to late March. Not all of High Water’s beers will be IPAs, of course. The third release, Old & In The Way English-style Barley Wine, is being brewed around now and will be aged in brandy barrels for a late fall or early winter release. The High Water crew will brew the barley wine again later to release a non-barrel aged version, and to blend the two together for a third barley wine creation. And those are just what Altimari called the “standard” High Water beers. There will also be four seasonals this year alone. In late spring, look for a Belgian-style ale with pomegranate and cherry juice. Next, High Water’s third IPA will emerge, fermented with Belgian yeast and maybe “a couple surprise ingredients,” hinted Altimari. The third seasonal will be a Baltic Porter (one version barrel aged, one not) and the final seasonal will be a lightly spiced holiday ale that will be out in time to grace your Thanksgiving table. Looking even further ahead, Altimari is currently growing some wild yeast starters at his house that will be used to produce sour beers we can try in 2012. Yeah, yeah, patience…how long’s that gonna take? San Leandro, CA, January, 10, 2011 — Award-winning brewmaster Steve Altimari has begun production on the flagship product for his new venture, an artisanal craft brewery, High Water Brewing. The flagship brew – dubbed “Hop Riot IPA” and described as an “American IPA with a definitive ‘Left Coast’ attitude” – will be among the first offerings from High Water Brewing. It will be joined by “Retribution Imperial IPA” and “Old and In the Way Barley Wine”. “Our goal is to pour High Water’s first beers, Hop Riot and Retribution, at the San Francisco Beer Week’s Gala opener on February 11,” said Altimari. He promises the initial offerings “will be followed by other innovative and exciting brews.” Beer fans can expect that promise to be fulfilled because creatively brewed beers with playful flavor surprises are hallmarks of Altimari’s style. After his departure as longtime brewmaster for Valley Brewing, Altimari decided to launch a new enterprise and take the craft of beer making to the next level. Leveraging his successful 15 year industry career, he partnered with John Anthony and Lane Anthony, also both seasoned veterans of the craft brewing industry, to start their own California Bay Area brewery. In addition to serving as Brewmaster, Altimari is the company President; John Anthony is CEO and will head up the sales effort. Lane Anthony is Board Secretary and will also be involved with sales. The High Water team is rounded out by legal counsel Kevin Sweeney and CFO Davin Abrahamian. Altimari will craft High Water beers at Drake’s Brewhouse in San Leandro, CA, and fermentation will occur in High Water tanks at the same location. High Water beers will be available in 5.0 and 15.5 gallon kegs and also bottled in 22 oz bombers. About the Company: Based in San Leandro, CA, High Water Brewing is a partnership with principals Steve Altimari, John Anthony, Lane Anthony, Kevin Sweeney and Davin Abrahamian serving as company officers and on the board of directors. Currently, capital is being raised for the new venture and the board has authorized the sale of one million shares at ten cents per share, with a minimum investment of $250 and a maximum investment of $25,000. You may recall the formerly wonderful beers of Valley Brewing in Stockton, California. That was due to one singular reason, their longtime brewmaster, Steve Altimari. Steve’s beers have became some of the most creative, innovative and diverse of any brewer. He perfected one style after another and brewed some truly experimental gems. His Uber Hoppy Imperial IPA was one of the best and his London Tavern Ale, a delicate English-style mild was a great session beer. But back on June 12th of last year, Steve was summarily dismissed under circumstances that could charitably be termed “odd.” I got the full story a couple of days after that, when I spoke to Steve in New York, where he was vacationing with his family. The owners initially told him that they’d sold the brewery (something he himself had been trying to do at that same time) and that the new bosses no longer needed his services. That tuned out to be not true in the least, and they instead brought in a scab brewer who flew in from Bend, Oregon, apparently, to do the brewing. I’m told they also locked Steve out of the brewery and refused to return his personal property that was there, including beer, barrels, etc. The good news was that since he’d been trying to buy Valley brewery, he already had investors and a management team in place. So it’s six or so months later, and I’m pleased to announce that Steve’s new brewery — High Water Brewing — has begun brewing. They’ve set up offices and cold storage in San Leandro, California, near Drake’s Brewing, whose brewing equipment they’ll be using to make High Water’s beer. They’re also installing their own fermenters on site but will store the finished beer in their separate offices nearby. The beers will debut on draft — 5 & 15.5 gallon kegs — in February during SF Beer Week (yet another reason I can’t wait for SF Beer Week!). Packaged beer, in 22 oz. bottles, will follow in early Spring, most likely in April. You can see the new labels on the website. They’re also still seeking additional investors, and if you’re interested, you can read about High Water’s investment opportunities. In the interest of full disclosure, the name High Water Brewing was suggested by me in a post back in June when this all went down, and after an exhaustive search, my suggestion turned out to be the one they liked best. The founders of the brewery were kind enough to thank me by awarding me some shares in the company, giving me a very teeny tiny interest in the company, essentially a symbolic, but very much appreciated gesture.